NiCK'S SANCTUARY: Tis But a Scratch! Those of you who have watched the film "Monty Python and the Holy Grail" will doubtless remember the infamous scene where Arthur does battle with the Black Knight who blocks the road ahead. 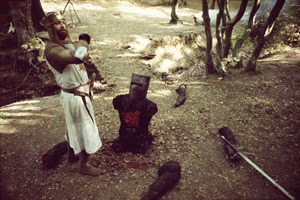 The battle goes badly for the Black Knight.... he loses an arm, followed by his other arm, then both his legs. Hilariously though he repeatedly insists that the damage is not severe... "Tis but a scratch!" 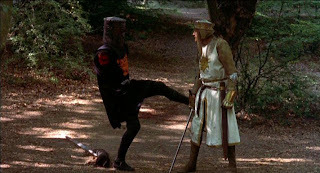 and "It's only a flesh wound!" are among his battle cries. We laugh because the situation is ridiculous, the scene uses hyperbole to parody the Hollywood image of the macho man - the hero who shakes of his injuries to save the day. 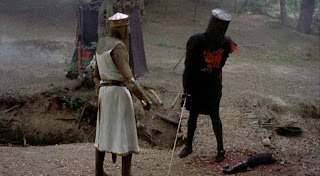 Obviouisly, Python's Black Knight should know when he is beaten and stop fighting... it is only a stretch of road he's fighting for, after all. On a deeper and more subtle level, are we seriously any different though? I know of a person who was severely damaged emotionally through the break-up of their marriage. I knew through conversations we had; that there were still issues going on inside that person's heart... but they kept jumping from relationship to relationship - constantly on the rebound. They "knew" in each case that the person they were with, was "the one". I know this because I was very nearly one of "the one's" myself... but fortunately it did not work out. Now I hear that the girl is planning on getting married again; I wish her well but I do not think she is embarking on a wise course of action. She is putting what she wants in front of her ability to handle it. She is rushing into a path that could damage her further... because she is chasing a dream without properly dealing with the damage that has been done to her in the past. I've recently come to the conclusion that some of the psychological issues attached to my physical scars need healing (February 3rd - Scar Tissue). I think my own approach to people in the past has been seriously affected by my damaged nature... but I know God desires to heal this. I also wait for the day when a woman comes along whom I can love and who can love me... but I believe the right person will not be able to find me (nor I them) until God disentangles me from the jungle I have managed to wrap myself up in over the years. Why should you or I have to wait, why does God seemingly string us out? If he's made a promise he could snap his fingers and allow you to have it immediately. Oh I have no doubt he could give you and I everything good that we desired - right here, right now... but would we be ready for it? Are we being honest with ourselves? Are we really ready for the things God has promised? If we desire a relationship... are we really ready to commit ourselves, or do we know in our hearts that we need God to fix something wrong in us first? If we desire revival... are we really ready to receive the multitudes of convicted people whom God will send, or do we know deep down that we need to humble ourselves and strengthen our relationship with God... that we may be of use to him when the time is right. These are just two examples of what I mean. I rushed into trying to enter a relationship a couple of years ago... it went pear shaped. God showed me through scriptures in Chronicles that in effect, I had mirrored King David's mistake with the Ark of the Covenant. I had put the desire and the promise of good things before properly being able to carry out a righteous approach to achieving them. God was merciful to David and showed him how to do it. God is also merciful to us and he will show us what we need to know if we only bothered to ask him. May the Lord bless you and enable you to walk the road before you. May your innermost desires - founded in the Father's will, the Son's intercession and the Holy Spirit's conviction, all be fulfilled in God's power and God's time. In Jesus name, Amen.